Paint Store :: Shop by Brand :: Duckback :: DUCKBACK DB-1460-4 SUPERDECK WOOD STRIPPER SIZE:1 GALLON PACK:4 PCS. 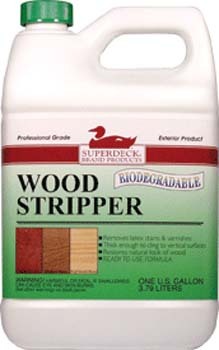 Remove old deck finishes with Superdeck Wood Stripper-DB-1460. Biodegradable Formula Strips Away Paints, Stains & Varnish. DAP 58550 FASTPATCH 30 PATCHING COMPOUND POWDER SIZE:3.5 LBS. MINWAX 42300 EARLY AMERICAN 230 STAIN SIZE:PINT. MINWAX 35555 GLOSS POLYCRYLIC SPRAY SIZE:11.5 OZ. SPRAY. KRYLON K360 SPRAY WEEKEND FLAT WHITE SIZE:11 OZ. SPRAY PACK:6 PCS. TUF TOP 11-701 BRICK RED SILICONE ACRYLIC WATER REPELLENT CONCRETE SEALER SIZE:1 GALLON.